Brand loyalty for Coke is strong. Coke changes its cans, but consumers are still loyal. To celebrate the 125th anniversary of Coca-Cola, The Coco-Cola Company is marking the year in a number of ways. Coke has never been shy about making changes – remember New Coke? – and sometimes the company plays with the designs on its cans. This winter, Coke joined forces with the World Wildlife Fund (WWF) to fundraise on behalf of polar bears, a Coca-Cola mascot since the 1920s. Specially designed cans of Coke are decorated with polar bears to call attention to the Arctic Home initiative. Coca-Cola Plays with Cans, Could You? Seasonal cans of Diet Coke will show up in silver with snowflake designs. Some loyal Coke fans seem to be okay with that, however, other Coke fans love red and are unhappy with the change to white cans, even for the holidays. This is really too bad since the change to white cans is for a very good cause -- protecting polar bear habitat. Seems like some soft drink consumers forget that the holidays are not just about celebrating, but also about caring and socially responsible charitable giving. Coca-Cola has long been associated with special advertising and designs for the holidays. This year, a more lasting change will be made to the Diet Coke can – beyond the usual holiday decoration. In 1982, Coca-Cola extended the brand by launching Diet Coke. This year, the Diet Coke can was re-designed by the Turner Duckworth design firm in San Francisco. The can has a fresh, modern look but has retained the same design colors of red, black, and silver so recognition should be easy and quick for consumers. The Coca-Cola Company seems to have mastered the social network and social media sites as a way to create some fun for loyal consumers. From Facebook, brand fans can be a Coca-Cola AHHH Giver (thats ahhh! as in "Ahhh, I love the great taste of Coke!" and "Ahhh, how sweet - my friend was thinking of me!") by sending a coke to a friend. That gift of Coke can come right from the hand of the inventor of Coke, Dr. John Pemberton, who speeds the gift along with a wink, or it can be a special coke that delivers points which can be used to help protect polar bear habitat through the Arctic Home initiative. A commemorative book published by Assouline will feature Coca-Cola advertising, artwork, and photography reflecting the relevance of the Coca-Cola brand in popular culture over the past 125 years. Both digital (at the App Store for the Apple iPad) and hard copy versions of the book will be available worldwide. This is truly a book for shared moments and memories. It is worth noting that there is $650 version of the book and a $65 version for those who really will put the book on their coffee tables. Limited edition packaging in select markets around the world will be available this year to mark the 125 year milestone. The Coca-Cola heritage archives will be accessible by way of tours of the 360-degree Virtual Museum. The heritage archives have never been viewed by the public before this reveal for the 125th anniversary of the flagship product -- Coke. A new Coca-Cola Heritage App will debut in the App Store. 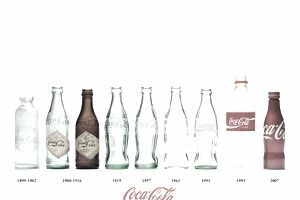 Featured in the application are an interactive timeline and a link to Coca-Cola Conversations, the Company’s blog that is frequently updated with interesting commentary and news. The Coca-Cola Company has come up with many exciting ways to thank its loyal customers for making Coke what it is today. Celebrations are taking place around the globe. In the summer in the United States, Coke released a new packaging size for Coca-Cola – 1.25 liters (naturally) and invited people to enjoy "125 Years of Summer Fun." Community initiative grants were awarded in South Africa that align with the priorities of "Live for a Difference". "Live Positively" campaign was launched in Vietnam. Sustainability initiatives were kicked off in Kenya, including a Kenya Red Cross water partnership. Elements of Coke’s history were featured at the grand opening of the “World of Coca-Cola” exhibition in Russia. featured at the grand opening of the “World of Coca-Cola” exhibition in Russia. Commemorative postcards were distributed in Brazil to share happiness and communicate optimism from The Coca-Cola Company associates. Coke sponsored the Harare International Festival of Arts in Zimbabwe where more than 140 global artists and more than 1000 local artists shared and sold their art. The Coca-Cola Company uses a customer-based approach to market research, not a product-based approach. Because of Coca-Cola’s close relationship with its customers, it is able to create products that are focused on their market segments. Market research enables Coca-Cola to determine the type of product consumers seek, the best places to promote and distribute the products, and the price that offers consumers the best value for their money. Consumers in different markets can be quite different, even when their consumer profiles appear similar. Coca-Cola Vanilla is a good example of this phenomenon. Coca-Cola Vanilla was established in the U.S. with a good market following, but the Coca-Cola Company wanted to extend the brand to the U.K. Market researchers tested the product concept in the U.K. in order to gauge the response of consumers and Coke fans. Through taste tasting, Coca-Cola was able to ascertain how the product should taste for Coke drinkers in the U.K.
Focus groups held with consumers were the basis for identifying the most attractive product design to have British appeal. The work of market researchers in a company like Coca-Cola is complex. Just think of what it takes to test and develop a product range that is attractive to consumers around the globe. The Coca-Cola company and its market research department and market research partners does this very well. Market research keeps tabs of consumer perceptions about the current range of Coca-Cola products, and it helps the company to extend the product range by focusing on customer-driven opportunities. The Coca-Cola Company regards market research so highly that it helped to establish and fund The Coca-Cola Center for Marketing Studies at the University of Georgia. The Master of Marketing Research Program is offered at the university.